I know, I’m sooo behind on my comics. I’ve been busy. Comics are my second hobby, so they fall by the wayside for work, family, and exercise. At work: we’ve been closing in on the new exhibit. Here’s a picture of the giant sloth skeleton getting installed. Don’t worry: they only see movement. If you stand still, you should be OK.
DC seems to be re-rebooting Green Arrow during the Zero Year event to make the comic book match the hit show more closely. This can’t be anything but good, because the original New 52 Green Arrow reboot was a juvenile mess. This issue is a solid origin story, but nothing to get excited about. This is the last straw. This issue is their Zero Year tie in, offering an origin story for Luke Fox and a retconned new archvillian. The story comes straight out of 1978 (not literally 1978: it’s supposed to be 2008), with Luke taking his nerdy friend to martial arts practice to gain the confidence he needs to defeat bullies at school. Bad stuff ensues after nerdy friend does not cotton onto the folksy advice of the sensei. Then: Drugs! Hulking out! Apparent death in the Gotham River! Ominous splash page ressurection! Batwing was good, once. It was one of the standouts of the New 52. I dropped it in the wake of this awful issue, and Stu at Emerald City Comics indicated I was the last holdout at our LCS. Too bad: I want to support diversity in mainstream comics, but I can’t support bad writing. Hence my addition of Ms. Marvel, about a Muslim superheroine from New Jersey. Also, I added Pretty Deadly, penned by Gail Simone, which was the keystone to a recent harrassment debacle in the comics industry. That seems like a good recommendation to me! Superheroes are always better with swords, right? This is one of the standouts of this batch of comics. Kubert imagines how the world would be if Bruce Wayne had died instead of Damian. This miniseries promises to be compelling and thought-provoking. I recommend you pick this up (or get it collected in trades when it’s done, three issues from now). This is a good bridging issue, setting up a bigger showdown to come. I continue to like the way the story is framed from Margo’s perspective, and I appreciate that she is taking initiative in the story arc. Also, I like the Shadow getting to laugh his trademark laugh before gunning down mafia baddies. If you judge me for my costume, I’ll just have to let my pet tiger eat you. This is my favorite of the batch. 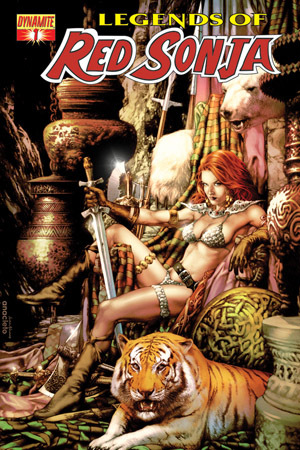 Gail Simone has arranged for an excellent group of women creators to each tell part of the story of Sonja’s history with the Grey Riders. I don’t want to spoil any of this great book. Let’s just say Sonja seems to be good at making enemies. This Batgirl: Wanted tie-in is a passable story, but not good enough to justify its $4.99 price tag. No more Nightwing for me, even with tie-ins or crossovers. Fool me once, shame on you. Fool me $4.99 for an annual, shame on me. Spoiler alert: Deadpool kills Deadpool in this one. In the end, the grand resolution of this four-part miniseries left me feeling flat. I think it might be that they KILLED OFF PANDAPOOL, THE SPECIES THAT ENDANGERS YOU. That might be why. Overall, it was worth the $2.99 pricetag. Not like that Nightwing (or Batwing, for that matter: it was $3.99! I want my $1 back!). There. Thoughts recorded. More soon. Also, maybe some science blogging, too.